Shikra is not threatened at this moment. This species is common in the driest woodland and savannahs with trees, and may be often seen near habitations. 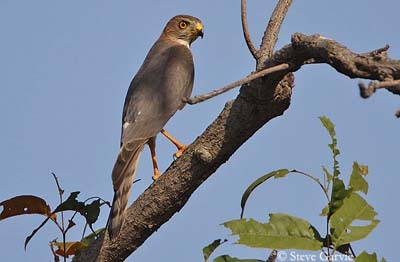 Shikra adult has yellow bill and legs, and red eyes. Wing tip is rounded. Outer primary tips are black. Head and upperparts are blue-grey. On the underparts, throat is whitish with median vertical black line. Breast and belly are white, finely streaked with reddish, darker on the breast. Undertail feathers are grey, barred with darker grey. Female is larger than male. She has dark orange eyes. Juvenile has brown-spotted breast, streaked flanks, brown eyes and a black line extending down to the breast. Shikra is usually silent, but during the breeding season, it often utters loud and repeated “kiiu-kiiu-kiiu”. It also gives repeated shrills “kewik”, with quavering last syllable. 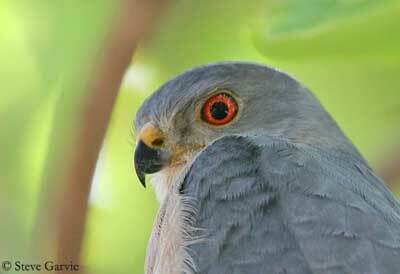 Shikra frequents woodlands and savannahs, arid steppes, small exotic plantations and urban parks. 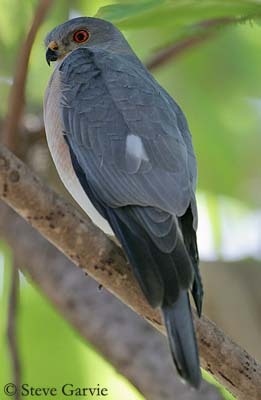 Shikra is found in Africa, south-east India and Sri Lanka. 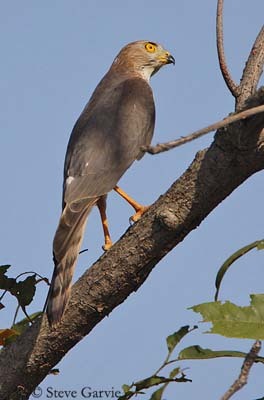 Shikra hunts from a perch hidden within vegetation. It performs rapid flight in order to catch the prey on tree trunk, among foliage or on the ground. It also performs aerial pursuits and its attacks are very powerful. Shikra is migratory. Some birds move to Arabia, mostly to Pakistan, India and South Asia. The species is resident in numerous locations in Africa and India, but regularly moves between the most dry and humid savannahs. Shikra has an agile flight allowing it to swoop down to the preys for catching them. It performs rapid wing beats and short glides. Shikra is very noisy before the nesting season. It builds the nest, a small platform made with sticks, lined with bark chips. It is situated in tree fork, mostly towards the exterior or on horizontal branch. Female lays 2-3 eggs at the end of the dry period. The incubation lasts about one month. Chicks are covered with pale bull down with white nape. They fledge about one month later. Shikra feeds on lizards, geckos and small birds, nestlings and eggs, bats, rodents, frogs and insects. It rarely takes carrion.